There used to be a lot of bodegas in Barcelona, a sort of wine shop and tapas bar, where you could buy bottles of red or white wine, vermouth, cava, etc or simply bulk wine while you were having a nice tapa, but this sort of business is slowly yielding ground to stores ran by immigrants or shutting down because owners retire and their sons don't want to go on with the family tradition. Anyway, some are still there spread around the city, some retain the original mood and charm and others have reinvented themselves to survive adopting a new concept. 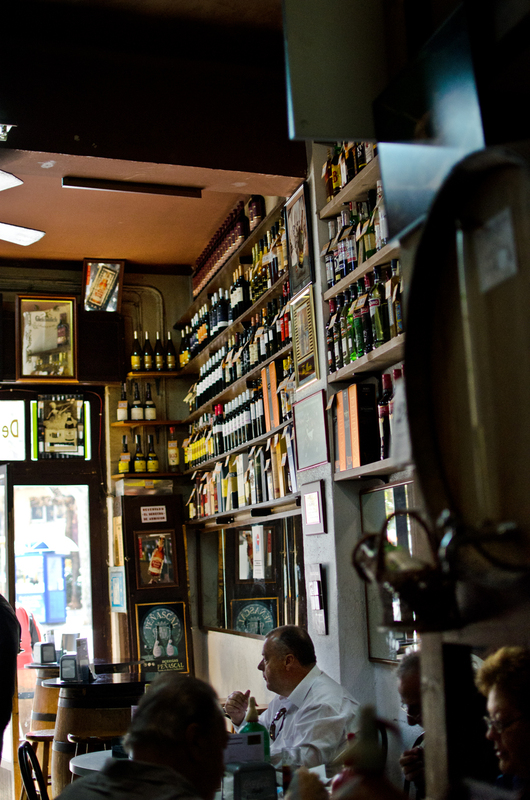 In case you want to visit them, here is a short list: Bodegas in Barcelona. In this picture, you have, Bodega Lluis in Calle Pinar del Río, 74. They have the best anchovies in the city according to many clients, including me. But this blog is about street photos so, just like to point out that I like the scene with the man looking towards the entrance and the light coming in this small universe of bottles and wine casks.